IMPORTANT: New (and Confusing) Marriott &amp; Starwood Application Rules Coming Soon &ndash; Apply Before They Kick In! 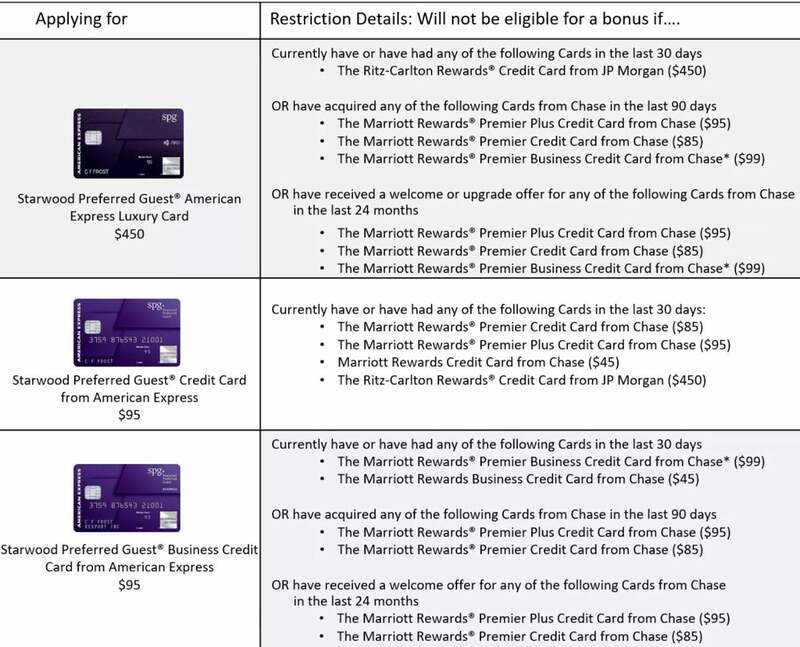 Beginning August 26, 2018, AMEX and Chase will have tighter application restrictions on their Marriott or Starwood cards. 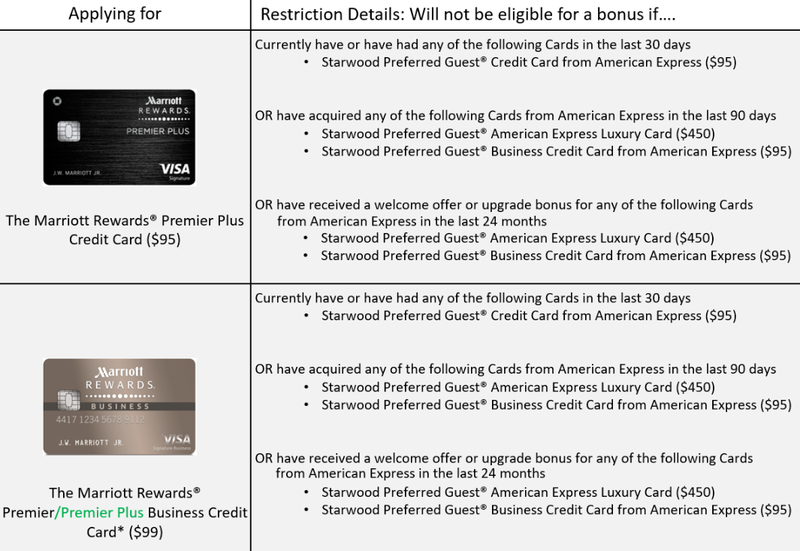 These new rules will make it MUCH harder for folks to open multiple Marriott and Starwood credit cards. So if you’ve got your eye on any of these cards, you should apply before August 26, 2018. The rules are a bit complicated, but I’ll give you a reminder of them, and the credit cards they apply to. And on August 23, 2018, the new AMEX Starwood Luxury card is expected to launch. The welcome offer is rumored to be 125,000 Marriott points after spending $5,000 on purchases in the first 3 months of opening your account. So if it launches on schedule, you’ll have a 3-day window to grab that one before the new restrictions are instituted. If you’re interested in any of these cards, I recommend applying ASAP! But keep in mind the following bank rules. 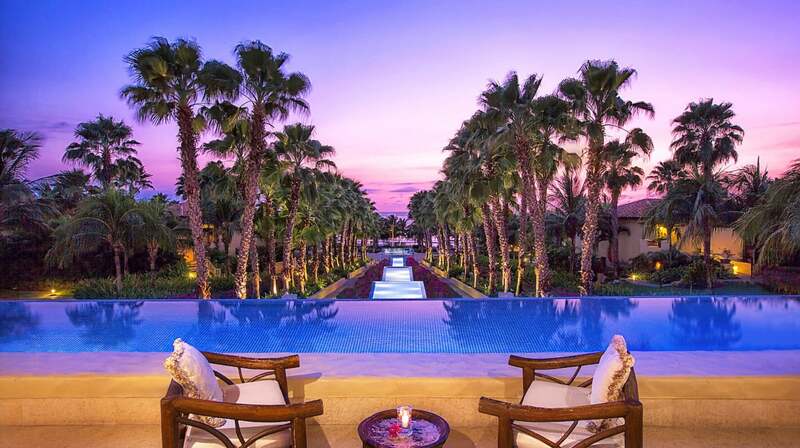 You can only earn the welcome bonus on an AMEX card once per lifetime. Plus, you can only open 2 cards every 90 days, with 5 days between applications. Meanwhile, you can only earn the bonus on a Chase card if it’s been 24 months since you last earned the bonus on that specific card and the card is closed. The only card here impacted by Chase’s 5/24 rule is the Chase Marriott Premier Plus card. The personal cards on this list will count toward your “5/24” status, while the business cards won’t. Read this post for a better understanding of what the heck is happening on August 26, 2018. In ~4 days, it will be harder and more confusing to open multiple cards that earn Marriott points. So plan your Marriott and Starwood card applications before the new restrictions hit on August 26, 2018. I highly encourage you to read this post to help your strategy along. Not applying for certain cards now could mean you’re missing out on hundreds of thousands of Marriott points. Which can translate to thousands of dollars in Big Travel! What’s your application strategy before these new rules kick in? If you want to stay on top of other miles & points deals, then subscribe to our newsletter. And be sure to follow us on Instagram!